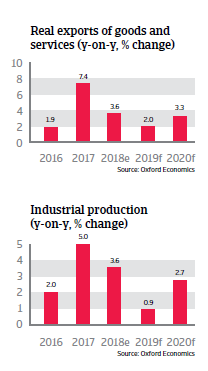 Taiwan´s economic expansion is likely to moderate in 2019 and in 2020, as both global trade growth and mainland China´s import demand have cooled down. The mainland regards Taiwan as a ‘renegade province’ and has repeatedly threatened to use force in the event of a formal declaration of independence. After the DPP won the January 2016 presidential and general elections, Beijing has scaled down high-level contacts with the new, more pro-independence minded government and has taken a more assertive stance in bilateral relations. However, the Taiwanese government has so far abstained from any actions that could provoke a harsh response from Beijing. Taiwan´s economy is mainly export-oriented (focusing on electronics and computer equipment, basic metals and plastics), with the export of goods and services accounting for more than 70% of GDP, and with 40% of outbound shipments - mostly electronic devices - destined for mainland China. 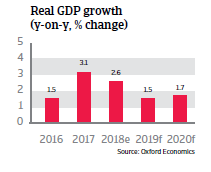 Economic expansion is likely to moderate in 2019 and in 2020, as both global trade growth and Chinese import demand have cooled down. Domestic demand is impacted by low wage growth and the contraction of tourism from mainland China following President Tsai’s election. At the same time, Taiwan has one of the lowest levels of foreign investment in Asia. Public finances are very sound, as government debt remains low at about 30% of GDP. The budget deficit is also expected to stay low, at below 1% of GDP in 2019. Taiwan’s external financial situation is very solid, with low external debt. The current account surplus is very large (more than 10% of GDP in 2019) and the country has ample foreign reserves. High dependence on mainland China as the major export and investment destination makes the Taiwanese economy susceptible to an economic downturn in China and to the repercussions of any escalation of the Sino-US trade dispute. Taiwanese electronics manufacturers still benefit from economies of scale and have managed to lower unit costs. Another strength of the industry is its precision and reliability. However, as mainland China’s industries have accelerated their technological development, Taiwanese electronic businesses are increasingly coming under competitive pressure, especially in the semiconductor segment. This could restrain Taiwan´s export growth momentum in the future. Taiwan will have to look for new high value-added alternatives in the mid- and long-term, with productivity increases and the diversification of the economy being long-term challenges. Taiwan´s working age population started shrinking in 2016, exacerbated by the fact that many talented young Taiwanese are moving abroad for work, including to the mainland. The ageing of the population could become a social and economic issue in the future (e.g. pension liabilities impacting the public budget). Plans for pension cuts for the civil service and the military led to large demonstrations and protests in 2018. 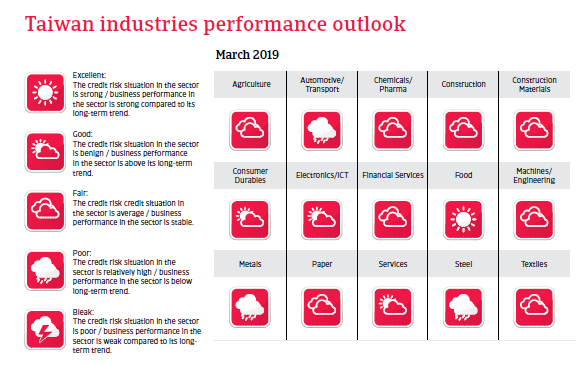 Southeast Asia is facing headwinds in the face of the US-China trade war and increased global market volatility, but strong domestic policymaking and economic fundamentals should mitigate risks.